Life of Bria by Sabrina Symington is a transgender themed comic that ranges from commentary to slice of life jokes and everything in between. Even when commenting on very serious stuff it remains funny—sharp, but funny. 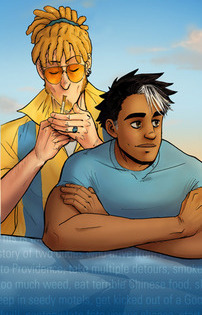 It’s one of the comics that I would see being reblogged on tumblr and lot and I’d think, “I ought to track down the artist so I can read more of these.” And I finally did. And they’re great! If you like Symington’s work, you can sponsor her on Patreon and she has a graphic novel for sale. Some of the comics I’ve previously recommended: Some of these have stopped publishing new episodes. Some have been on hiatus for a while. I’ve culled from the list those that seem to have gone away entirely. Check, Please! by Ngozi Ukazu is the story of Eric “Bitty” Bittle, a former junior figure skating champion from a southern state who is attending fictitious Samwell College in Massachusetts, where he plays on the men’s hockey team. Bitty is the smallest guy on the team, and in the early comics is dealing with a phobia of being body-checked in the games. He’s an enthusiastic baker, and a die hard Beyoncé fan. “Manic Pixie Nightmare Girls” by Jessica Udischas is a hilarious web comic that tells of the adventures of Jesska Nightmare, a trans woman trying to make her way in our transphobic world. The comics are funny, insightful, and adorably drawn. The sheer cuteness of the drawing style is a rather sharp contrast to the sometimes weighty topics the comic covers, and I think makes it a little easier to keep from getting bummed out to contemplate that the strips aren’t exaggerations. If you like the strip, consider supporting the artist through her patreon. The Junior Science Power Hour by Abby Howard. is frequently autobiographical take on the artist’s journey to creating the crazy strip about science, science nerds, why girls are just as good at being science nerds as boys, and so much more. It will definitely appeal to dinosaur nerds, anyone who has ever been enthusiastic about any science topic, and especially to people who has ever felt like a square peg being forced into round holes by society. “Stereophonic” by C.J.P. 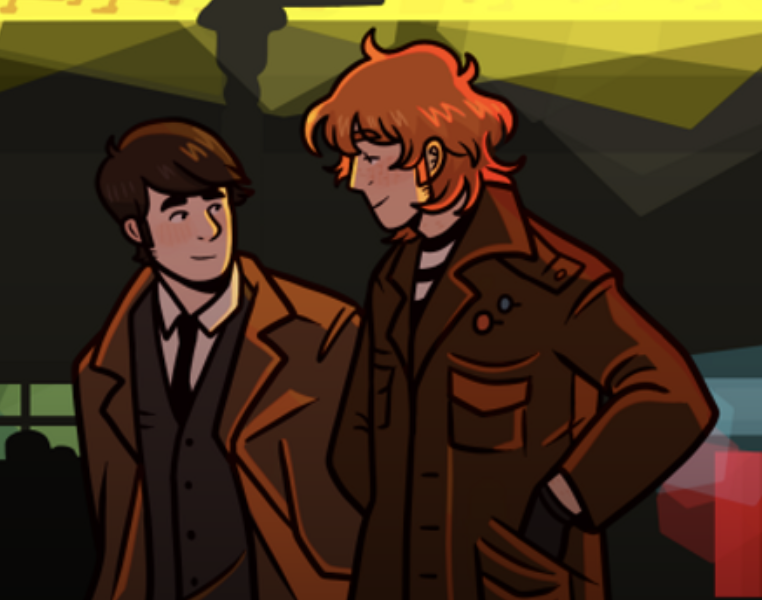 is a “queer historical drama that follows the lives of two young men living in 1960s London.” It’s a very sweet and slow-build story, with good art and an interesting supporting cast. But I want to warn you that the story comes to a hiatus just as a couple of the subplots are getting very interesting. The artist had a serious health issue which was complicated by family problems, but has since started posting updates to his blog and Patreon page, assuring us that the story will resume soon. If you like the 300+ pages published thus far and would like to support the artist, C.J. has a Patreon page, plus t-shirts and other merchandise available at his store. The Young Protectors: Engaging the Enemy by Alex Wolfson begins when a young, closeted teen-age superhero who has just snuck into a gay bar for the first time is seen exiting said bar by a not-so-young, very experienced, very powerful, super-villain. Trouble, of course, ensues. Tripping Over You by Suzana Harcum and Owen White is a strip about a pair of friends in school who just happen to fall in love… which eventually necessitates one of them coming out of the closet. Tripping Over You has several books, comics, and prints available for purchase. “Deer Me,” by Sheryl Schopfer tells the tales from the lives of three friends (and former roommates) who couldn’t be more dissimilar while being surprisingly compatible. If you enjoy Deer Me, you can support the artist by going to her Patreon Page! Scurry by Mac Smith is the story of a colony of mice trying to survive a long, strange winter in a world where humans have mysteriously vanished, and food is becoming ever more scarce. And I love this impish girl thief with a tail and her reluctant undead sorcerer/bodyguard: “Unsounded,” by Ashley Cope. Muddler’s Beat by Tony Breed is the fun, expanded cast sequel to Finn and Charlie Are Hitched. Fowl Language by Brian Gordon is a fun strip about parenting, tech, science, and other geeky things. The strips are funny, and he also has a bonus panel link to click on under the day’s strip. The Last Halloween by Abby Howard is the creepy story of 10-year-old Mona who is reluctantly drafted to save the world on Halloween night. This is by the same artist who does the Junior Science Power Hour. She created this strip as her pitch in the final round of Penny Arcade’s Strip Search, which was a reality game show where web cartoonists competed for a cash prize and other assistance to get their strip launched. Though Abby didn’t win, she started writing the strip anyway. 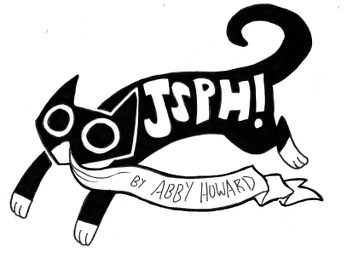 If you like the comic, you can support Abby in a couple of ways: she has some cool stuff related to both of her strips in her store, and she also has a Patreon. Last Kiss® by John Lustig Mr. Lustig bought the publishing rights to a romance comic book series from the 50’s and 60’s, and started rewriting the stories for fun. The redrawn and re-dialogued panels (which take irreverent shots at gender and sexuality issues, among other things) are syndicated, and available on a bunch of merchandise. 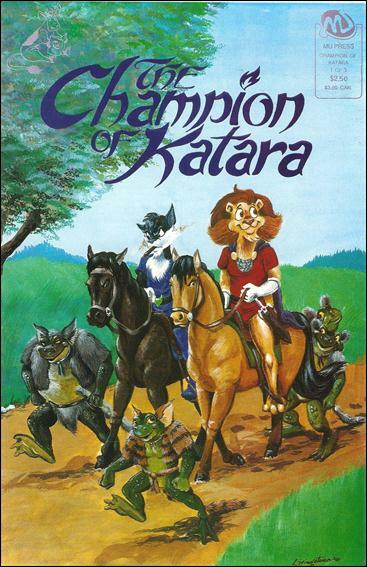 “Champion of Katara” by Chuck Melville tells the tale of a the greatest sorcerer of Katara, Flagstaff (Flagstaff’s foster sister may disagree…), and his adventures in a humorous sword & sorcery world. If you enjoy the adventures of Flagstaff, you might also enjoy another awesome fantasy series set in the same universe (and starring the aforementioned foster sister): and Felicia, Sorceress of Katara, or Chuck’s weekly gag strip, Mr. Cow, which was on a hiatus for a while but is now back. If you like Mr. Cow, Felicia, or Flagstaff (the hero of Champions of Katara) you can support the artist by going to his Patreon Page. Also, can I interest you in a Mr. Cow Mug? If you want to read a nice, long graphic-novel style story which recently published its conclusion, check-out the not quite accurately named, The Less Than Epic Adventures of T.J. and Amal by E.K. Weaver. I say inaccurate because I found their story quite epic (not to mention engaging, moving, surprising, fulfilling… I could go on). Some sections of the tale are Not Safe For Work, as they say, though she marks them clearly. The complete graphic novels are available for sale in both ebook and paper versions, by the way. Oglaf, by Trudy Cooper and Doug Bayne is a Not Safe For Work web comic about… well, it’s sort a generic “medieval” high fantasy universe, but with adult themes, often sexual. Jokes are based on fantasy story and movie clichés, gaming tropes, and the like. And let me repeat, since I got a startled message from someone in response to a previous posting of this recommendation: Oglaf is Not Safe For Work (NSFW)!